Nikunja Bihari Haoladar is one of the unique literary personalities of West Bengal. His prolific and unique writings made him very popular. Basically he is a non conformist and opposed to conventional history. He is a social scientist, historian, and famous researcher on Netaji. He has been awarded for those qualities thrice. He believes in social revelotion. He was born in a reach and cultural farmer family at Rajpara, Shitalpur village under Mathbaria police station of Barisal district of present Bangladesh. He had to settled permanently in west Bengal of India from his native land in his boyhood in 1950. he had passed the school final examination with first division from Gobardanga Khantura High School in 1958. Then he got admitted to Gobardanga Hindu College for intermediate with Science. In 1959, he was deeply attracted to Netaji and he started to gather information about Netaji. He had passed the Graduation with Hons in Economics and Political Science from Scottish Church College (Kolkata). During the early sixties, he become associated with the news paper, named “Jangrihi” which circulated the Shoulmari Episode about Nrtaji. He joined the movement of Parliament to voice protest against the antipathy of the Government to words Netaji in 1964, when he was a University student. He passed the M.A. examination (Economics) from Jadavpur University in 1969, he gave voluntary service in G.M.S.M. college of South 24 Pgs as a lecturer for one year. He was attracted to Yoga Sadhana in 1969 and led a life of Saunyasin for three years. He is a spiritualist at heart. He is a spiritualist at heart. He is an ideal teacher in 1965, he had started his professional career as a teacher of Gaighata Higher Secondary School (Multipurpose), then in 1966 he had shifted to Bowbazar High School (Kolkata)as an assistant teacher. In 1997, He passed the B.Ed examination with the special permission from the Calcutta University. He had started to publish a bulletin, named, “Swadesik” in 1984. Later it was stopped. Then he had written a book, named “Netaji Era” in 1996. His second book was “Brahmanyabad Bharatya Samajer Cancer” which was published in 2002, “Swadesik” was his third book which gained very much popularity from the readers. It was highly appreciated by the political circh. He retired from Bowbazar High School in January 2002. He started to published a bulletin named “Jagaran”in 2002. His famous published books are :-1)Netaji Era, 2) Brahmanyabad Bharatya Samajer Cancer, 3) “Swadesik”, 4)”Bangla Bhag Holo Keno” Gandhi myth” will be his fifth book. Awards for Essay on Netaji from Netaji birth day celebration central committee in 1986. Awards for Essay on Relevance of Netaji’s ideal on present situation from “Bharat Pathik” (Delhi) in 1996. 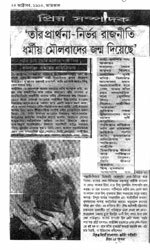 Award on research on Netaji from “Jamunamati” (News paper), in 2006.